Pankaj Singh, MLA, NOIDA – among others – unveiling the Hygiene eCurriculum to build awareness about hygiene & sanitation among school children. Dettol Banega Swachh India is a 5-year long campaign aimed at addressing the rising need of hygiene and sanitation in India. The campaign is powered by Dettol’s commitment to invest a sum of INR 100 Cr. towards this initiative. 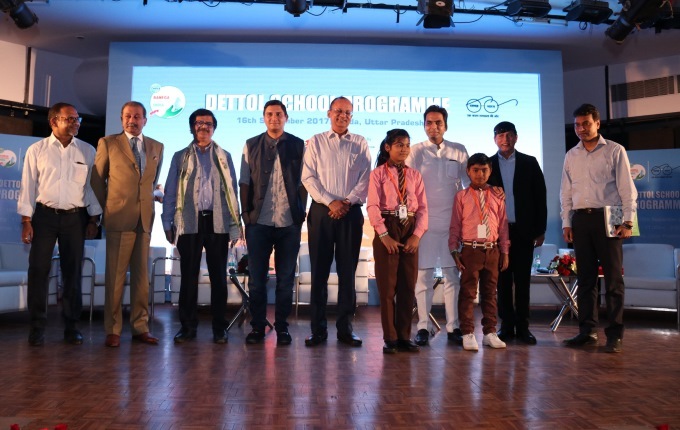 As part of this nationwide hygiene and sanitation campaign, Dettol Banega Swachh India, RB India and NOIDA District Administration came together to launch Hygiene Curriculum in 70 public schools across NOIDA. The Curriculum was unveiled by NOIDA MLA Pankaj Singh and was the release function was represented by senior dignitaries from NOIDA District Administration, Hygiene Council of India, Aga Khan Foundation, RB and Jagran Pehel. Developed by RB India, in partnership with Butterfly Fields and XSEED the key elements of the curriculum include Hygiene in School, at home, in the neighbourhood, personal Hygiene and Hygiene during illness. The Hygiene Curriculum includes 15 sessions per year along with teacher work books and games inspired from the teachings of Dr. Abdul Kalam. The Curriculum has three levels with 45 sessions in total for three years. It is meant to cover primary secondary schools kids and strengthen behaviour change on Hygiene and Sanitation. It also includes the creation of Children Parliament where children’s Right to Hygiene will be ensured by young champions. The programme has already been successfully deployed in 5,000 schools across rural parts of 7 states touching 25,00,000 students. The programme has also already reached 50,000 teachers who were trained at a ratio of 1 teacher per 50 students. The programme has garnered positive impact with overall increase in awareness about washing hands, students following sanitation practices, knowledge about prevention of diarrhea and maintaining clean toilets in schools.